February starts off here in Ontario from snowy and blizzard-like conditions to lovely but extremely cold temps. So many people question this where I live, but to me it's Canada, it's Ontario, and it's winter-time. Everyone is itching for heat, and for some, their gardens I guess. Very understandable! I'm afraid we have a ways to go for that though. Not only is natural sunshine good for us, but did you know that certain foods are considered bone builders? These types of foods replenish the skeletal system because they are rich in calcium like low fat dairy products. Kale, spinach and broccoli do the same. Necessary levels of sodium are needed too, and these are found in celery, bok-choy and rhubarb. Bone builders are considered very helpful in fighting osteoporosis, which means bones become porous and subject to fracture and slow healing. Have you heard about WITT? The Western Institute of Technology at Taranaki Educational Institution in New Zealand offers certificate and degree level courses in everything from nursing to agriculture. 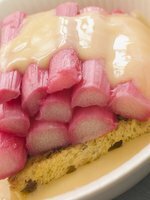 The hospitality industry is definately on the list as well and Chef Denis Duthie has three good recipes and tips to share using rhubarb. One recipe in particular is used in the training sessions there. Rhubarb and date chutney is a "teaching tool" recipe in the Diploma Professional Cookery Course, and is made and served for lunches on Fridays there in the WITT restaurant. It's a wonderful compliment to cheese and lasts for ages as long as it is sealed well. Put the onions in a large pan with the ginger and vinegar. Bring to the boil and then simmer for 10 minutes. Add rest of the ingredients, except rhubarb, and bring to the boil, stirring. Simmer, uncovered, for about 10 minutes until the apples are tender. Stir in the rhubarb and cook, uncovered, until the chutney is thick and jammy, about 15-20 minutes. Leave the chutney to sit for about 10-15 minutes and then spoon into warm, clean jars and seal. Label jars when cool. Keep for at least a month before eating. with your name on it, or post it anonymously too if you prefer. 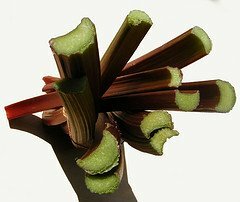 Happy to share your favorite with other rhubarb lovers. Tomatoes and rhubarb compliment bland meat dishes very well according to the Chef at WITT. A rhubarb shortcake is a favorite as well, and his tips for the pastry are "pastry is best made on a cold day, always use chilled butter, and don't work it too much as your hands heat it up. Look for this recipe and a meat recipe of his next month! Check out North Dakota's Maple River Distillery. Their rhubarb cordial just won a gold medal at the Indy International Wine Competition. Their rhubarb cordial competed against cordial and liqueurs from all over the world. Their rhubarb vodka is apparently quite a seller too in comparison to their rhubarb wines. If in their area, look them up. By the way, I've now joined Twitter. So, if you are a Tweeter, or like to get tweets, please do visit and follow me there too if you like. 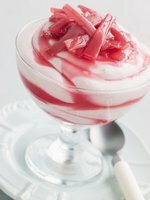 Just go to Twitter.com and Search "Savor The Rhubarb"
Do you use cornstarch or flour as a thickener? Try tapioca granules or quick cooking tapioca for this rhubarb streusel pie. This recipe by Bobbie Sue of Vermont, was a favorite of their customers and her family continues to enjoy it today. In a large bowl combine all filling ingredients and set aside. This allows the rhubarb to juice while the crust is rolled out and the streusel topping is prepared. Bake at 450 for 20 minutes. Reduce heat to 350 and bake for 45 minutes to an hour or until the pie is done. Filling should be bubbling close to the center. Remove pie to a rack and cool completely. If desired, the pie can be served slightly warm. Apparently there will be a reference made in one of the UK Garden Mags April issue. I was quite honored to be contacted and asked about this. Looking forward to it! Speaking of the UK, the Wakefield Festival is coming up there and I'm sure will be well attended as usual. The site is undergoing some structural and technical changes over the next little while, in order to freshen things up and just be a bit better overall. So, if anything looks odd or out of place, it's only temporary.